I just finished my first book for review and it was excellent! I posted my review over at Five Minutes for Books, but I wanted to make it about twice as long because I had the hardest time choosing which quotes to use and which examples to give. Then it occurred to me: I could post a review over there, and then review it AGAIN here and use other quotes. So you should go read my post over there first, and then come back and get more details here. There’s still a lot I’m leaving out, so you’ll want to read it yourself. 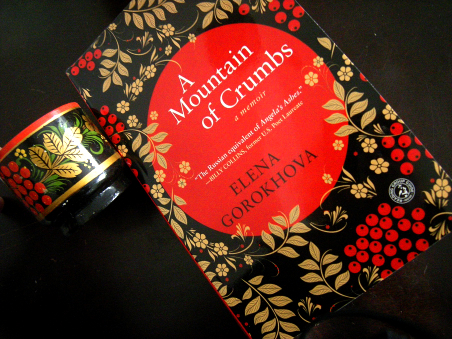 A Mountain of Crumbs: A Memoir is a memoir written by Elena Gorokhova, who grew up in Soviet Russia in the 1960s and 70s. Although she’s got the horror tales—like when her uncle tells an old, mild joke about not needing to get book for a superior because he’s got one already, and is taken away and shot for being subversive—this is ultimately the story of a life. As such, it deals with her relationship to her older sister, her memories of running away from nursery school, white nights in Leningrad (which is of course now again St. Petersburg), with its lace ironwork and pearly domes. She beautifully recounts a summer in the family’s dacha, her father going fishing and her mother cooking raspberry jam in the heat, her father caught in a storm once and returning late, while the family was so worried they couldn’t speak. She tells of his death when she was 10; after her mother petitioned and petitioned the local communist party, they finally allowed her father—who’d been a member for more than 40 years—to be admitted to hospital. In fear, her mother has Elena call for an update. A disembodied voice announces to the child that her father has died. The writing is sparse but often beautiful, with descriptions that transport through space and time. I love how she sees the story of her country echoed in her own mother’s life. Her mother is approximately the same age as the communist government, and for Elena, the parallels are evident. Both are overprotective and short-sighted and overbearing and all-encompassing. It is only when she leaves both of them, marrying an American and moving to Texas, that she is able to make peace with the relationships. Yet she has glimpses of a different mother, in a portrait from when she was a teenager, and in an old journal she finds. How did it happen? How did her mother change so much? she both wonders and worries. 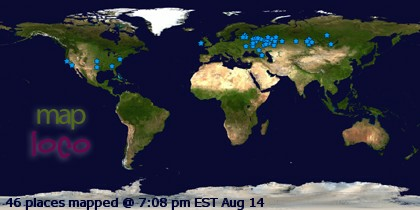 Donn visited Russia (the far east) in the late 90s. He brought back these painted wooden cups that I love, one for each member of the family. Unfortunately somewhere along the way, we lost one of the kids’ cups. (How is this possible? We would always have packed them in the same box. ??? For those of you who don’t believe in malignant fairies, think again! Or possibly universal black holes opening at random whenever people are in transit. Seriously. Related: how could we lose half of Abel’s Diary of a Wimpy Kid Box of Books , when we packed all his books in one box?) The reason I bring this up is that the cover of A Mountain of Crumbs: A Memoir matches the cups! How cool is that? Oh, I will have to read this. I’ve had a love affair with Russia ever since I was around eleven or so and learned about Nicholas and Alexandra (and yeah, the possibility that Anastasia might have survived did influence that fascination considerably). The very age of the land, the completely different worldview from what we have here in this country, the richness of their heritage and traditions, all of it – even the ugliness of the communist years. This book looks right up my alley! A GREAT review. (I do think you should show us a picture of the cups, tho.) How cool that you got that gig! Would love to read this – love your reviews, both of them! Made my way from 5 Minutes. What a lovely blog. I’m a new subscriber. We lost a round cushion that we use on a stool in our bathroom. Maybe you have it? Seriously — where could it be?? Love your cup — it really does match, and SO happy to have you and your perspective on our team at 5 Minutes for Books!! You are a fantastic reviewer! I also have had an obsession with Russia ever since I did a report on the possibility that Anastasia survived in high school. The country’s history is fascinating. I’m adding this book to my reading list! Tu me donnes envie…I recently read a book based in the Ukraine, but a few years later…Moonlight in Odessa, this after reading several books based in Africa, especially Nigerian authors.